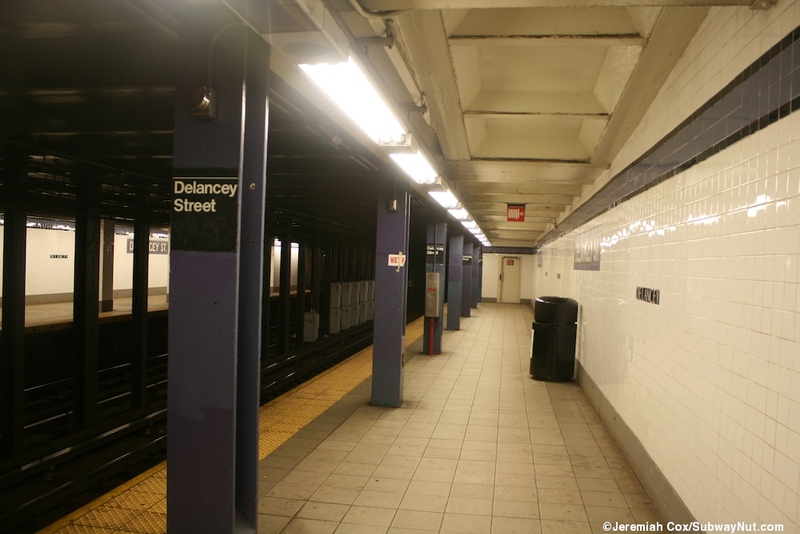 Delancey Street is a quite deep IND Subway station because of the underpinning of the BMT tracks that lead over the Williamsburg Bridge. 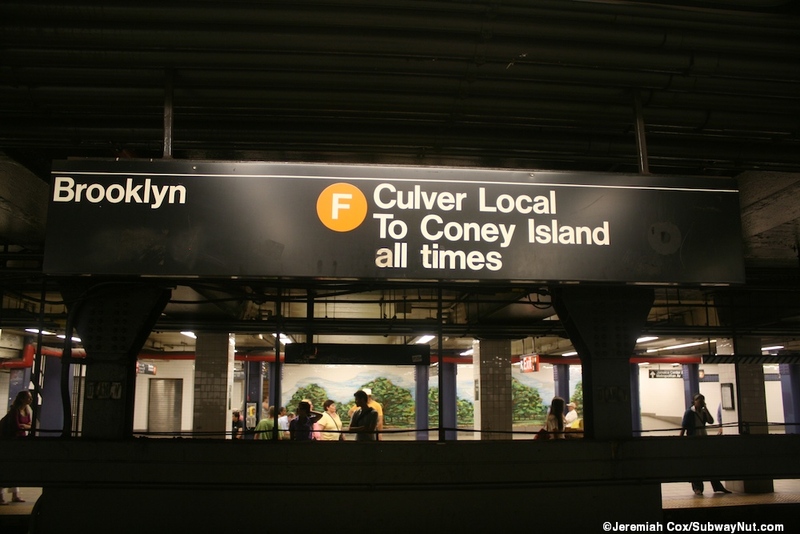 The IND platforms are only used by the F train going to the Rutgers Street tunnels, M trains curve off of the IND at the Chrystie Connection to reach the BMT with trains skipping 2nd Avenue only made by F trains. 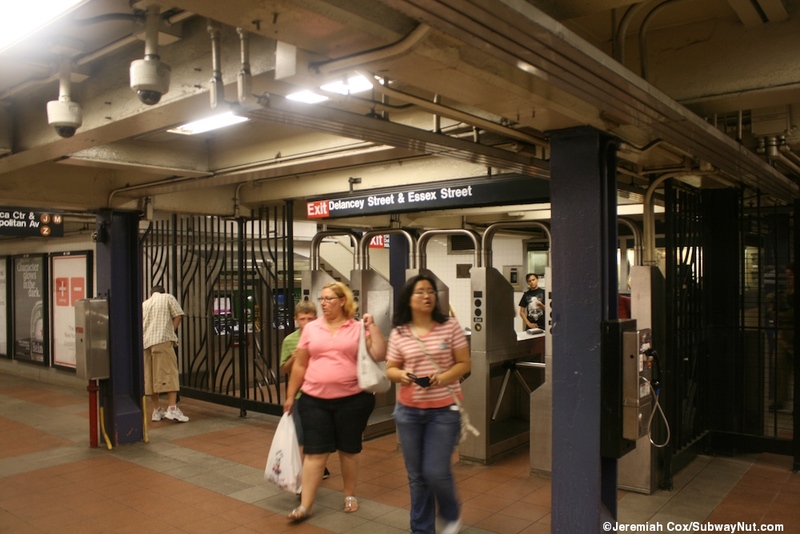 This means that passengers heading north on Sixth Avenue can take the F or the M which can leave from either platform and often wait on connecting staircases. The station has two side platforms for the 2 track line. 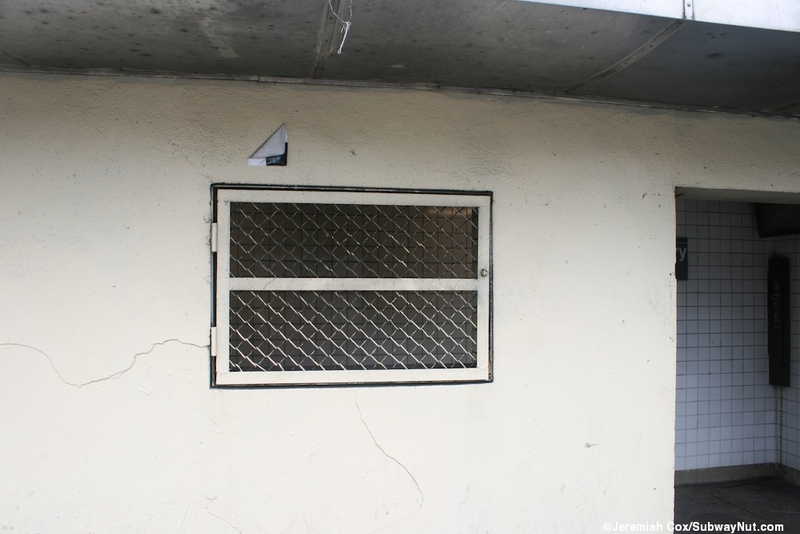 The platform walls have purple trimlines of two tiles with black borders. 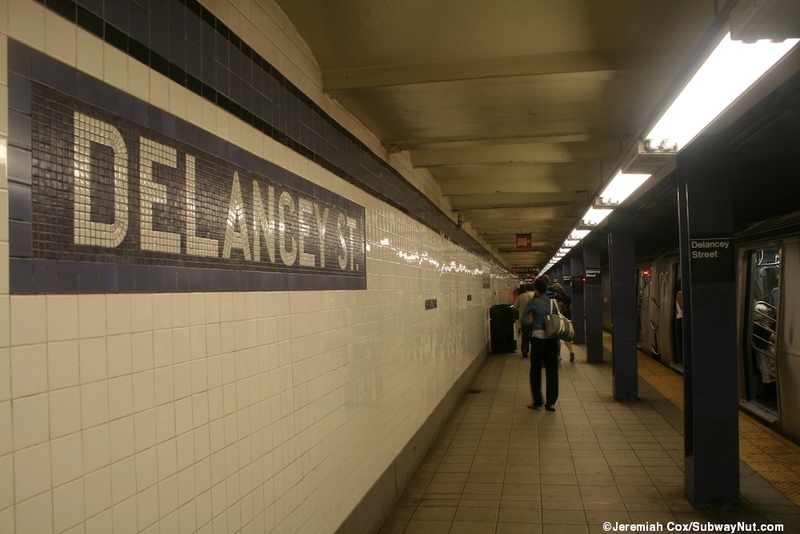 Beneath the trimline are Delancey St. name tablets with white text on entirely purple backgrounds and borders. 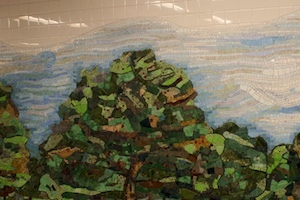 The station was renovated in 2004 and the walls were retiled. 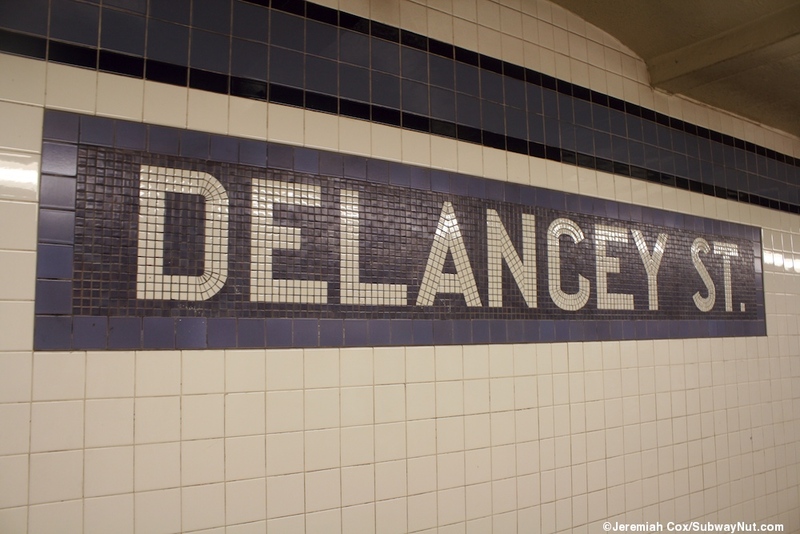 Black tiles with white text spell out Delancey in an Serif Font in the middle of the wall (where name tablets don't exist) instead Delancey tiled beneath the trimline where it originally was as is usual in station design on the IND. 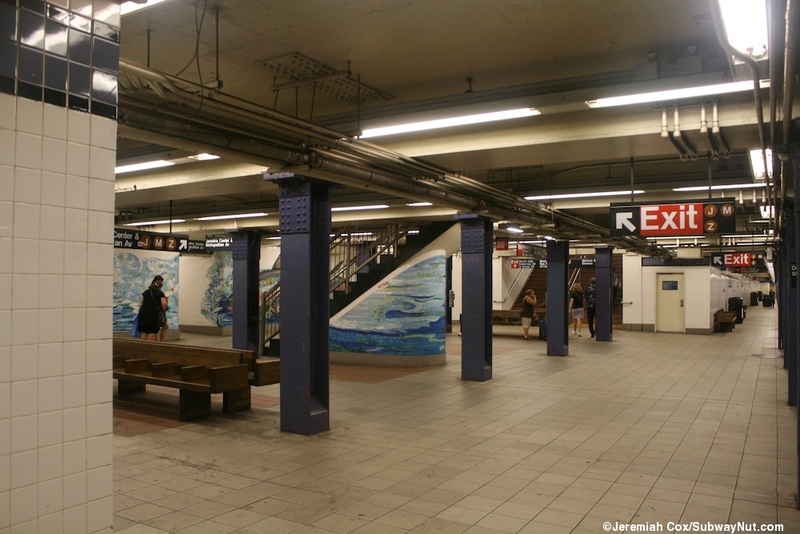 The uptown platform has a line of tiled columns with little Blue D's along them. 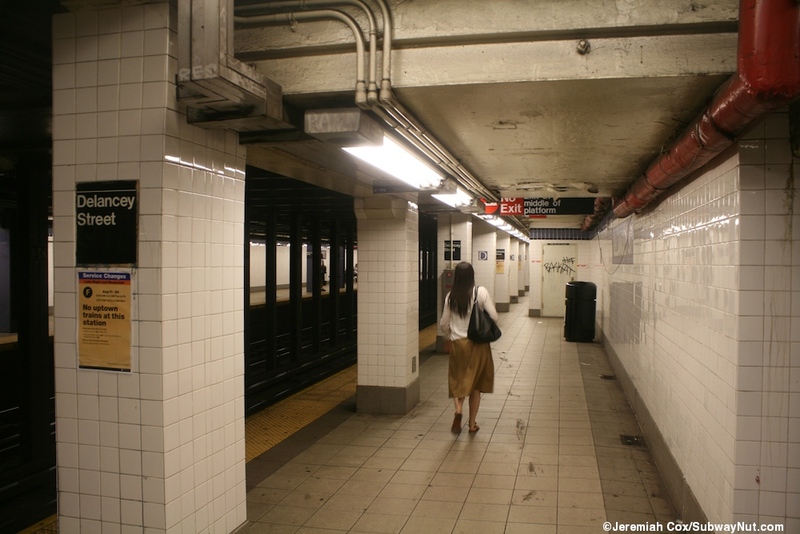 The downtown platform has normal columns painted purple like the trimline without any more distinguishing features. Access to the IND platforms is only at the exact middle of the platforms. 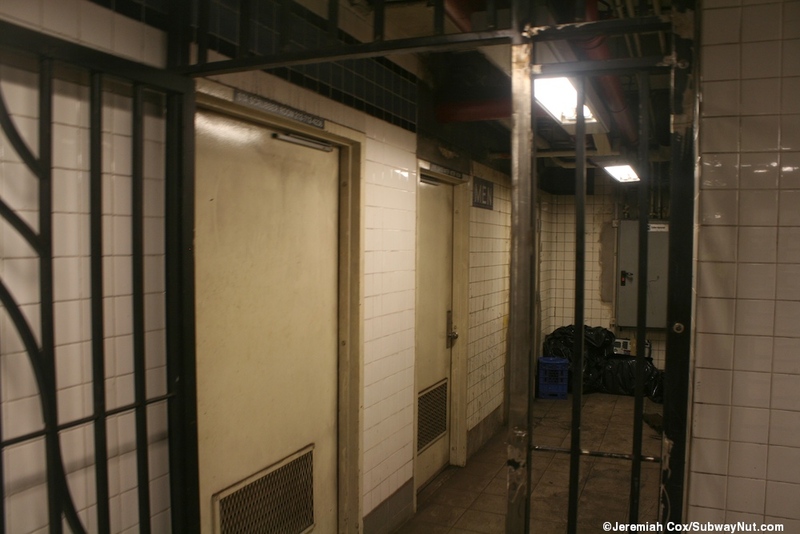 These areas also provide the only access to the J,M,Z platform over the Williamsburg Bridge. 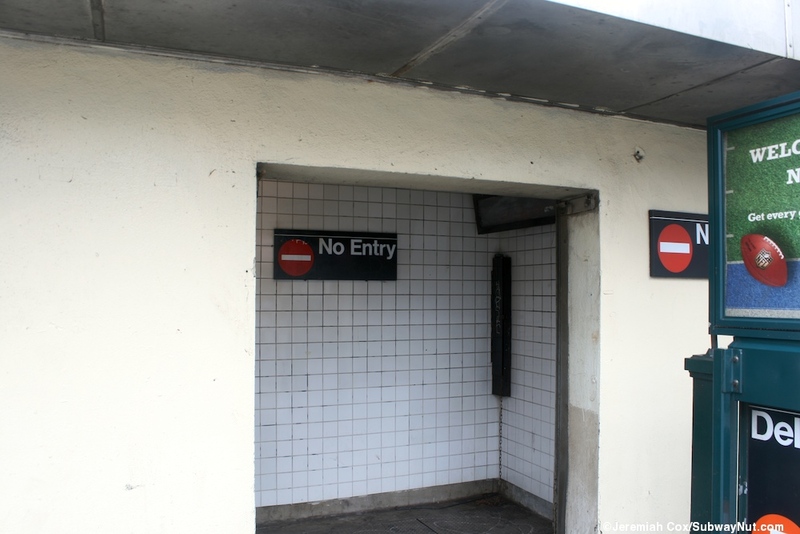 These areas are extremely wide; separate fare control areas for the BMT and IND platforms were probably in these areas before free transfers were instituted. 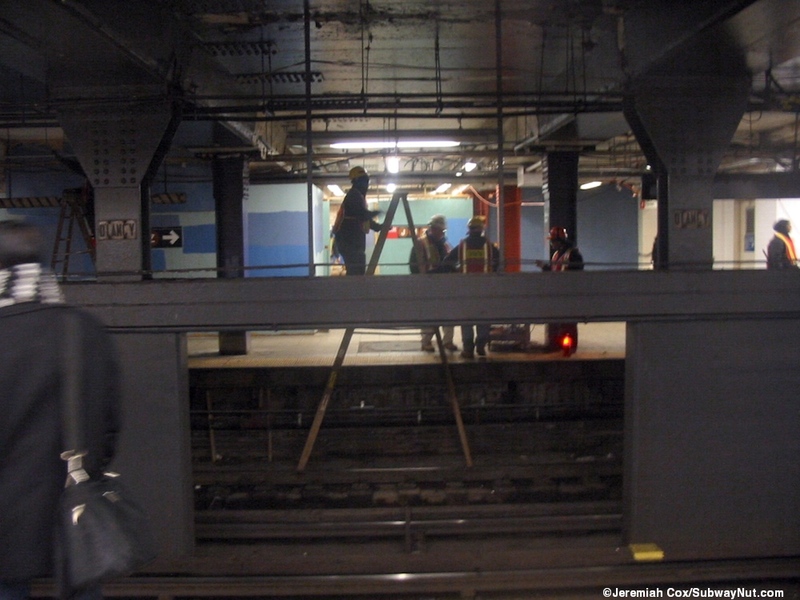 The layouts differ slightly: the downtown, Brooklyn-bound platform has two staircases across from and facing each other (and not the platform) lead up to the southern end of the Brooklyn-bound J,M,Z platform. The easternmost staircase loops around at an intermediate landing. 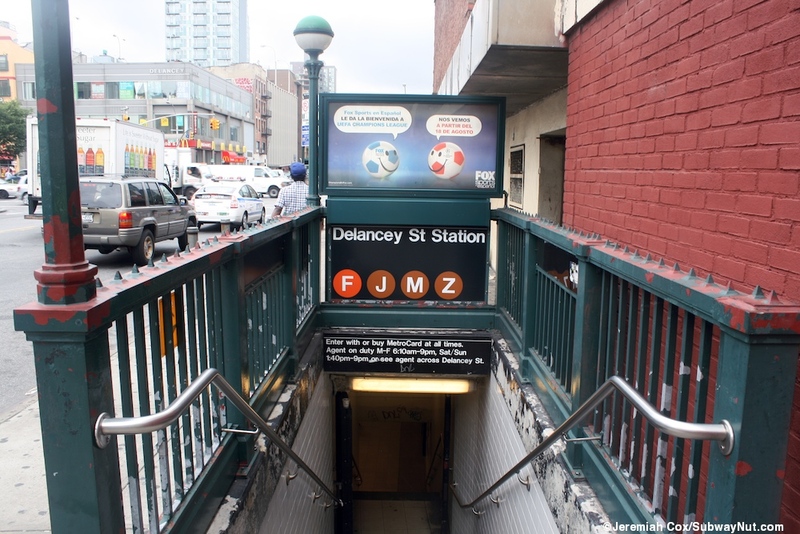 A staircase leads up to the south side of Delancey Street fare control area and another much wider staircase leads to the north side of Delancey Street exits and continues up to the Uptown M/Downtown J, Z platform. 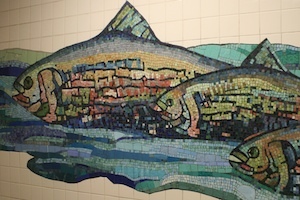 The uptown, Queens-bound platform is more complicated. 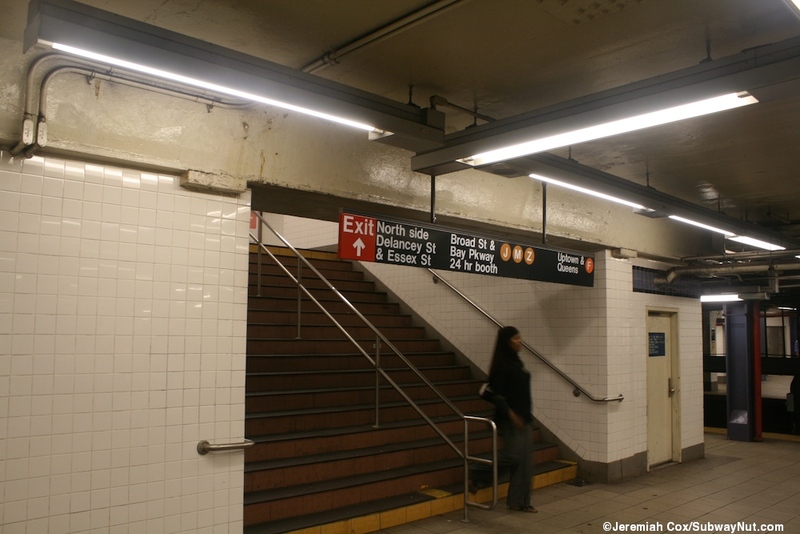 A staircase leads up a few steps to an intermediate landing where it splits into two before continuing up to the Williamsburg-bound J,M,Z platform. 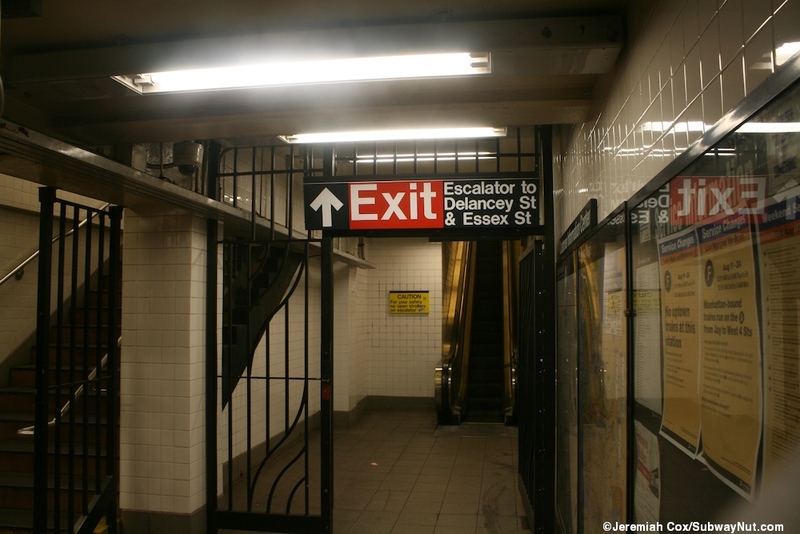 On the northern side of the exit area a staircase leads directly up to the Uptown M/Downtown J,Z platform. 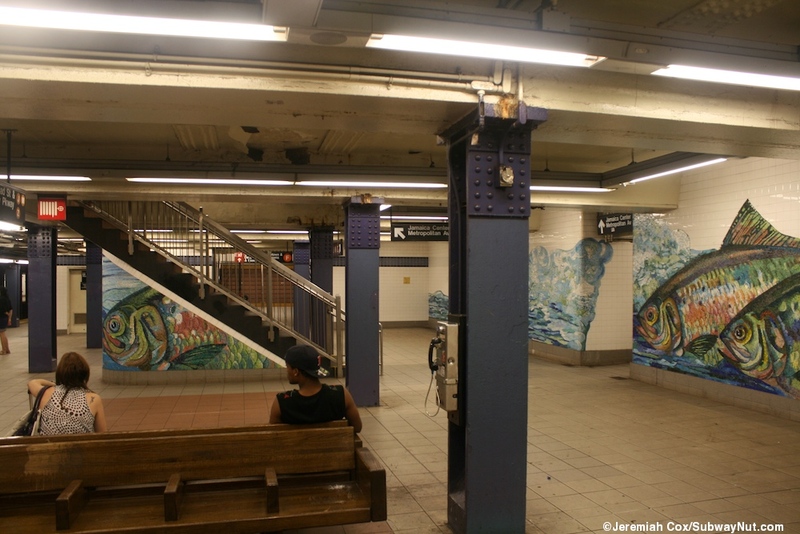 It is on this staircase that many subway riders heading uptown on 6th Avenue will stand to catch either an F train on the lower level or an M train on the upper level. 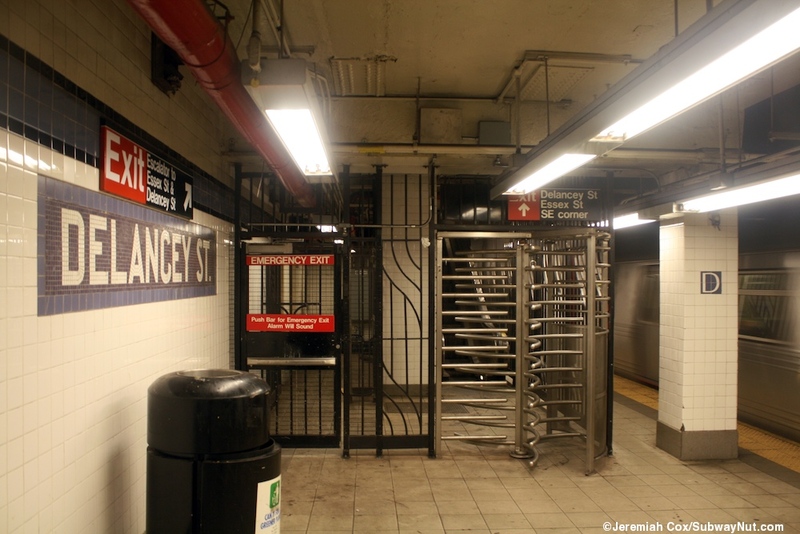 Another, wider staircase leads up to the north side of Delancey Street fare control area. At the opposite southern end of the area is a high exit only turnstile this leads to a narrow and quite long escalator (that makes you respect how deep the F train platform is) up to the east side of Delancey Street with an upper landing at street level in a nondescript building with peeling paint and a gate that can be closed if needed, there are few No Entry Signs. 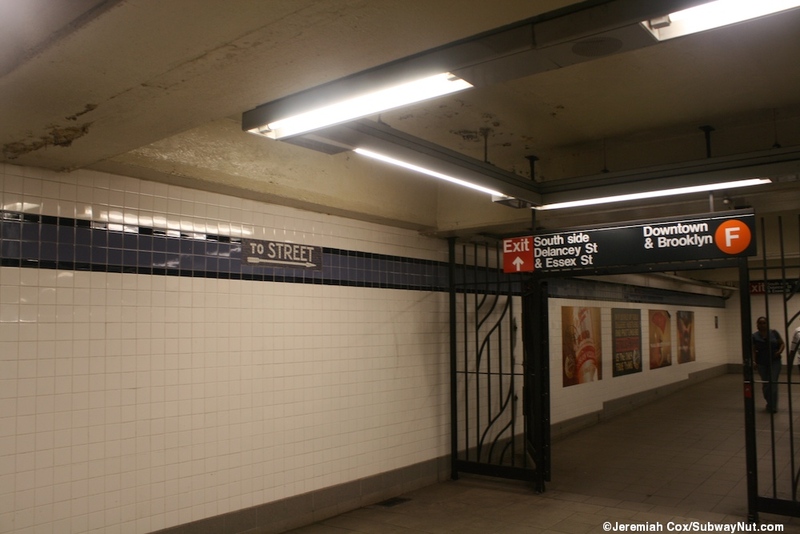 In front of it is a normal streetstair on the sidewalk, this and a streetstair directly at the SW corner of Delancey and Essex Streets lead down to the south side fare control area it has unstaffed both high and low turnstiles and the previously mentioned staircase down to each F platform (and access to the J,M,Z platforms through there). The northside fare control area is more substantial and includes the 24 hour token booth. 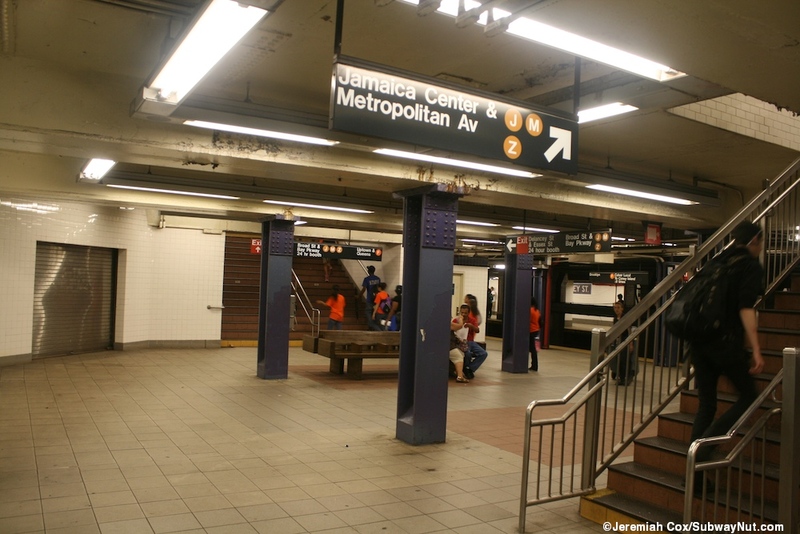 It has the wide staircases up from the two F platforms plus a super wide one down from the Uptown M/Downtown J,Z platform. 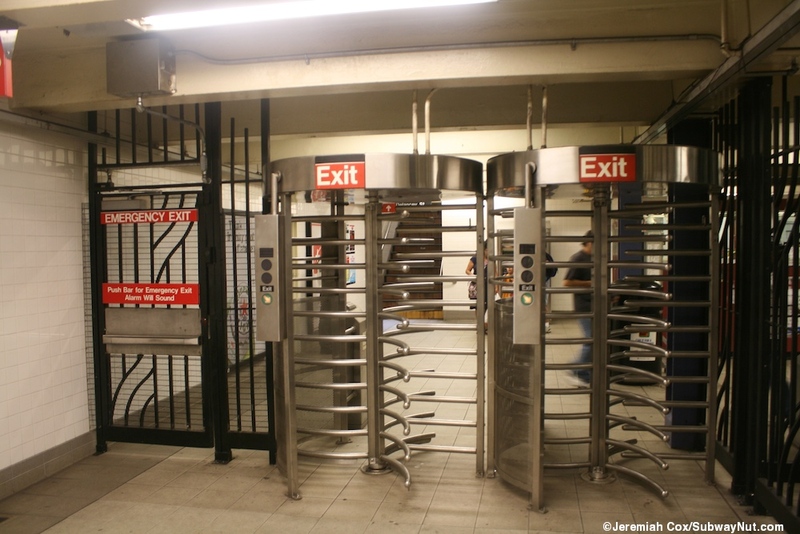 The turnstiles lead to an up only, narrow escalator near the NE corner with Essex Street along Delancey Street that arrives at the street with a landing inside the building that houses the Essex St Market and has a similar number of No Entry Signs (it is similar to the escalator to the southside of the street). 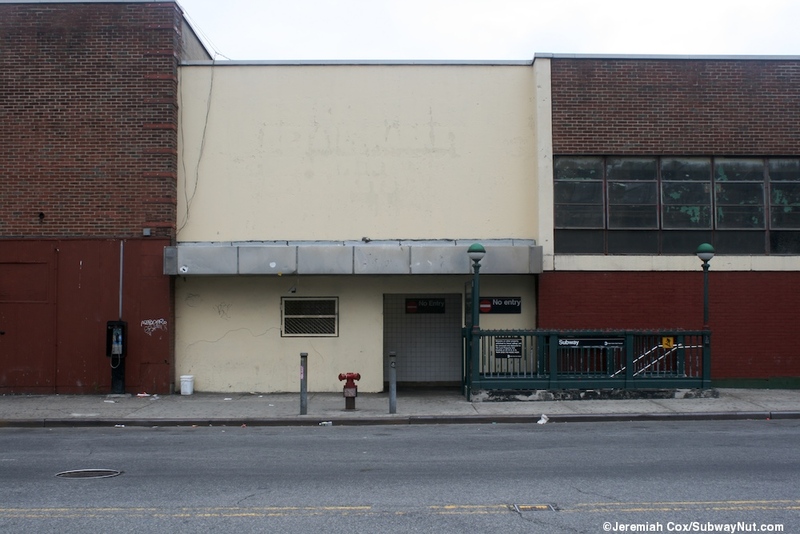 A Streetstair leads up to this area right in front of the intersection with another streetstair to the NW corner of Delancey and Essex Street.